By Susan Stern – Omaha, NEBRASKA — An appliance repair shop takes 30 percent off – if you pen a Google review. A dentist office enters you into a contest, and your favorite restaurant gives you a FREE cocktail – in exchange for Google reviews. “Wrong, wrong, wrong. Companies offering incentives for reviews – violate Google’s Terms and Conditions,” emphasizes Omaha branding consultant Susan Stern, of Stern PR Marketing. Businesses giving rewards-for-reviews are a widespread problem from Maine to California. In fact, here in Omaha this marketer has found dozens of metro-area small businesses violating Google’s review policy. 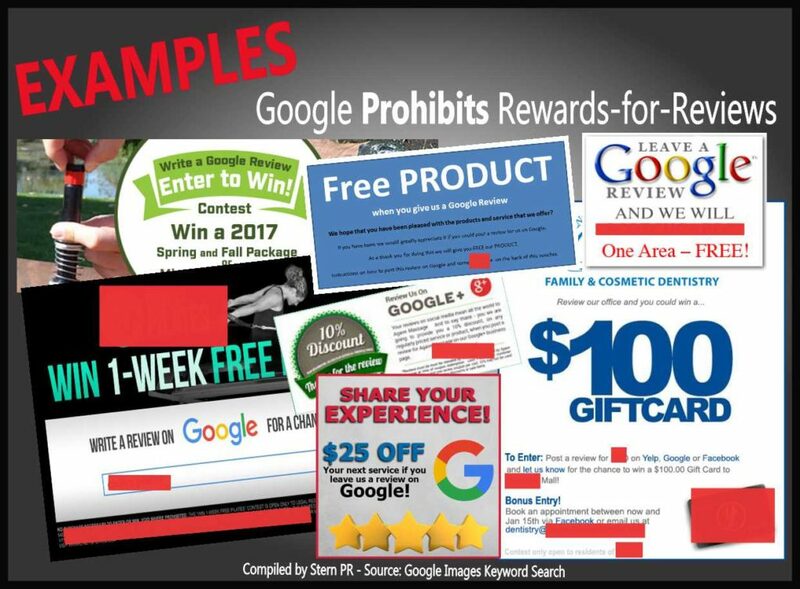 A quick Google image search found a plethora of inappropriate review incentives nationwide, too. Our digital marketing firm mashed a few together for this informative montage – what not to do. As a consumer, it’s easy to understand the inherent bias in rewards-for-reviews. Compensation creates a conflict of interest. Also prohibited by Google, is setting up review stations or kiosks at your place of business aimed at obtaining reviews. Business violators face repercussions – yet another reason small and medium-size organizations should outsource online marketing, advertising and PR to a specialist well-versed in the rules. Offering compensation for reviews on Google can result in a suspension or permanent removal of a business listing, and all the earned search juice could disappear – forever. This is why DIY business marketing is a risky endeavor. Best advise. Hire a pro to manage your online accounts, monthly. She’ll know the terms and conditions,” notes Stern. Final thought. Offering cash, discounts, coupons and contest entries to increase your Google review total – is a game you may eventually lose. Don’t do it. Don’t even think about writing fake reviews, as well. Either Google’s filter will discover the violation OR a human, perhaps a competitor, may report you. A business and its owners face federal agency scrutiny and repercussions, at the worst. A Georgia auto shipment broker learned an important lesson when the Federal Trade Commission filed an an administrative complaint against AmeriFreight for “misrepresenting online reviews by failing to disclose that it gave cash discounts to customers to post the reviews,” reports the FTC website in a 2015 news release. In explaining AmeriFreight’s violations of Section 5 of the FTC Act, the news release stated that the company deceptively touted itself as earning “more highly ranked ratings and reviews than any other company in the automotive transportation business.” The FTC notes the broker offered $50 off its services for an online review. Customers that refused to pen a review, would pay $50 more. The best reviews were automatically entered in a $100 per month give-way contest. AmeriFreight failed to disclose the material connect between the company and its compensated reviewers. The Federal Trade Commission’s action to maintain truth in advertising marks “the first time the agency has charged a company with misrepresenting online reviews by failing to disclose that it gave cash discounts to customers to post the reviews,” said the press release. While the FTC declined to levy a fine against AmeriFreight, the company faces a civil fine up to $16,000 for each future violation of the order. While the FTC does not prohibit compensation-for-online-reviews, Google does. The message here is this. If you own/manage a business, do not offer compensation for online reviews. Outsource your advertising, marketing and public relations to a professional consultant.